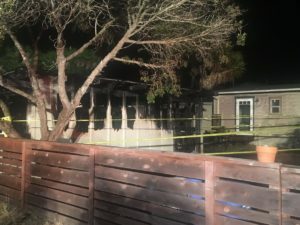 An electrical malfunction at a Morro Bay marijuana grow on Monday sparked a fire that destroyed a garage and damaged two homes, according to the city’s fire department. The fire broke out at approximately 2:13 a.m. in a garage in the 2800 block of Fir Avenue. Overhead electrical wires that were burned through and lying on the ground near the garage created an obstacle for firefighters. But, fire personnel contained the blaze and extinguished it by 2:55 a.m. Still, the fire destroyed the garage and caused minor to moderate damage to two adjacent homes. PG&E workers put a halt to the electrical hazard by 3:20 a.m.
Investigators determined the fire was caused by the misuse and overloading of electrical circuits, adapters and cords in order to power an indoor marijuana grow. Morro Bay police are continuing an investigation into the blaze. Three engines, two command vehicles and 11 fire personnel responded to the blaze. Morro Bay firefighters received help from the San Luis Obispo County Fire Department. Morro Bay fire officials stress to residents the importance of proper use of electrical cords, power strips and adapters. Electrical issues is one of the most common causes of fire deaths and injuries nationwide, according to the fire department. If I have a 400 gallon salt water reef aquarium that requires a 1000w light to keep it alive, no issue with insurance if something goes wrong and causes a fire, but if I put that same 1000w light over 6 legal indoor plants for personal use and something bad happens, that changes things? Color me confused. I don’t see anything in the article that says the grow was illegal or the person was accused of selling anything. Understanding the limits of the house wiring is important no matter what you are doing, but sometimes accidents happen, ie, faulty breaker, exposed wiring behind wall, etc. Not the first, nor the last. How long before home insurance goes sky hi because of the dope head desperado’s? Or maybe legalization, if done to the spirit of the law passed, will result in fewer problems like this as people don’t have to hide their activities and can use legal processes to create “grow houses.” Maybe the person responsible for this would have gotten the necessary permits and done alterations/construction to codes if his facility would have been legal at the time he built it? Will the Local cops do a civil asset seizure since the property was used in the illegal drug trade? The sheriff needs money for his navy boat! I wonder what the insurance company will have to say about this loss? They are not emotional in their decision making, they use the agreed to rules and actuaries to determine loss. If you don’t like their conclusion, “far out” will likely be the wrong response.